One of the wonderful things our children bring to us is an introduction to the different places they live. We loved Columbia, Missouri, where our daughter attended the University of Missouri (college town atmosphere, wonderful people), and Missoula, Montana, where our son attended the University of Montana (outdoors, outdoors, outdoors). Each location offered different positives. This spring we get to visit our son in Pittsburgh, and we have enjoyed our daughter's soon to be ending time in Pocatello, Idaho. I can't get enough of Pocatello's winter scenes, particularly the white mountains against achingly blue, blue skies and the yellows, greens, and browns of the sagebrush. This painting is based on several photos my daughter took. I wanted to capture the textures of the sagebrush, the snow, and the track of trail. 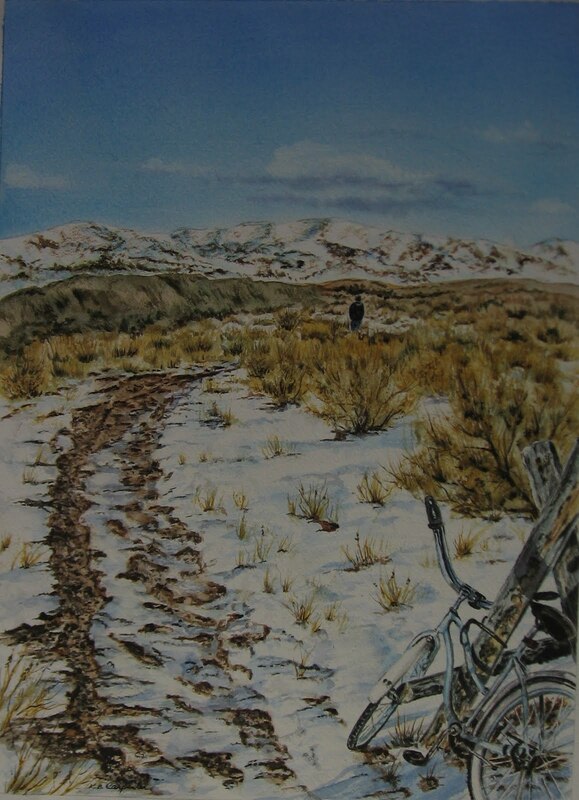 I was particularly drawn to the blues of the sky and the bicycle, so I decided to feature them together, linking them with the lone figure on foot. I liked creating the idea that the walker, the land, maybe even the bicycle are waiting for the melting of the snow, the warming of the earth...time to ride again! Beautiful! And it does the scenery far better justice than my photos ever could have.